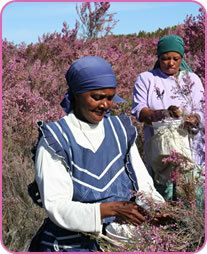 Heather Deliciosa is one of the many Erica varieties found in the Western Cape floral kingdom commonly called Fynbos. It is the smallest of the world’s six plant kingdoms yet it is the richest region of floral biodiversity. The flowers are gathered on the farm Grootvadersbosch, along the lower reaches of the Langeberg Mountains, in the Heidelberg district. In spring we strip the flowers from the bushes so allowing the bush to remain standing to produce flowers next year. The area is so vast that after our harvesting the amount we need, there is no visible difference causing no impact on the ecology of the area. 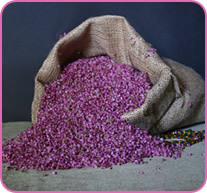 The flowers dry naturally and are sealed in air tight containers to retain their natural deep pink colour.